Wesley Tiku shows off some mustard greens, one of his store's most popular items, in the produce aisle of Kathmandu Baazar in Concord. New immigrants often face an unexpected challenge: how to navigate away from an American diet that takes a toll on your health? That’s becoming easier in New Hampshire due to a network of markets and farms that carry familiar foods for the state’s foreign residents. New Hampshire is home to a small but growing immigrant population; about one in 20 Granite Staters are foreign born. And there’s an experience that unites many of them: that bewildering first visit to an American grocery store. "There was a aisle with few vegetables - fresh vegetables - and there was a more aisle with cans and frozen food and stuff," says Kiran KC, a Nepalese immigrant. Wesley Tiku, a political refugee from Cameroon, had a similarly baffling experience shopping for food when he first arrived. "Except spinach most of the vegetables were unrecognizable," says Tiku. So Tiku and KC got together with a few friends and opened the Kathmandu Baazar, an Asian and African grocery store in Concord. The produce aisle is tiny, but packed with cassava, mangosteen, plantain, and guava. KC says their mustard greens "sell hot cakes." In other aisles, you can find peanut flour, bright red bottles of palm oil, and dozens of varieties of brown rice - staple foods for people all over Asia and Africa. Research shows the longer immigrants live in the U.S., the more the American diet and lifestyle negatively impact their health. But immigrants in New Hampshire are trying to create options for themselves beyond the traditional American diet. At Common Earth Farm in Bedford, Gail Prince shows off two African eggplant, a staple for Asian and African immigrants living in New Hampshire. "There really is a push to have access to healthy, affordable, locally produced food that’s culturally appropriate," says Andrea Bye of the Organization for Refugee and Immigrant Success. Gail Prince is the owner of Common Earth Farm in Bedford. She’s a retired Air Force Colonel with zero farming experience. Yet through donations and help from a non-profit, she’s opened just over an acre of farmland to refugees from Bhutan, in central Asia, and Burundi, in east Africa. The farmers grow amaranth, bitter melon, hot peppers and traditional New England crops, too. "This African eggplant is a comfort food," says Prince, crouching over a long row of six-foot tall plants. "They come to America and nothing’s familiar. This is familiar." Churches, schools and landowners have created similar farm plots across southern New Hampshire. Prince says farming is especially important for older refugees with limited English skills. "This place generates income, it gives them a sense of purpose," says Prince. "But also they bring their traditional foods home so they can teach and keep certain traditions going." Khada Niroula and his wife, Perabati, wash vegetables to sell in Manchester. This growing season, there are four farmers markets in Manchester catering almost exclusively to non-Americans. Niroula says farming in Bedford makes him happy because it reminds of him of his 40-acre farm back in Bhutan. "Corn, and potato, cabbage," says Niroula, referring to the crops he grew in Bhutan. "All same this. Bhutan, no snow. I came here, many snow!" Khada (R) and Perabati Niroula (L) wash fresh vegetables at Common Earth Farm in Bedford. The produce will be sold at a farmer's market in Manchester. For refugees like Niroula, farming seems to be bridging a crucial happiness gap. According to a 2012 study, Bhutanese refugees are twice as likely as the American populace to commit suicide, and four times more likely to suffer from depression, in part because it’s so difficult for them to maintain their cultural traditions. The Kathmandu Baazar has opened a lunch counter that serves Asian food. They’re looking for an African cook, too. Over a plate of steaming dumplings, Kiran KC says his grocery store has become a place to let loose, laugh, and be around people who speak your language. "You see at Dunkin' Donuts - in the morning you see a couple folks sit there, enjoy coffee and chit chat," says KC. "It’s pretty much the same here, too. And how many of us tell friends, 'Hey come meet me at Market Basket!" Bal Bikash Bhattarai, with the Bhutanese Community of New Hampshire, says anything that gets immigrants together, particularly around familiar food, is a good thing. But it can turn into too much of a good thing. Bhattari, who spent 18 years in a refugee camp in Nepal, is beginning to develop an American problem. "In camps I didn’t have any fats in my body. But now the fats are getting into my body. I don’t have a habit of carrying this much meat in my body," Bhattarai says with a big laugh. "I think I’m getting a little lazy because of car," he adds. A new documentary by New Hampshire filmmaker Doria Bramante follows exiles from the tiny Himalayan kingdom of Bhutan as they abandon their twenty-year effort to return home from Nepalese refugee camps and decide to seek a new life in America. Many of these refugees have resettled in the New Hampshire cities of Concord, Manchester, and Laconia. Today we take a look at their incredible journey…along with the challenges and successes of starting over in the Granite State. In the past several decades, farmers markets have developed into a significant source of sales of Vermont agricultural products, driven by increasing demand for local food. Winter markets and even virtual farmers markets are one sign of success. In recent years, though, the number of summer and winter markets has leveled out. 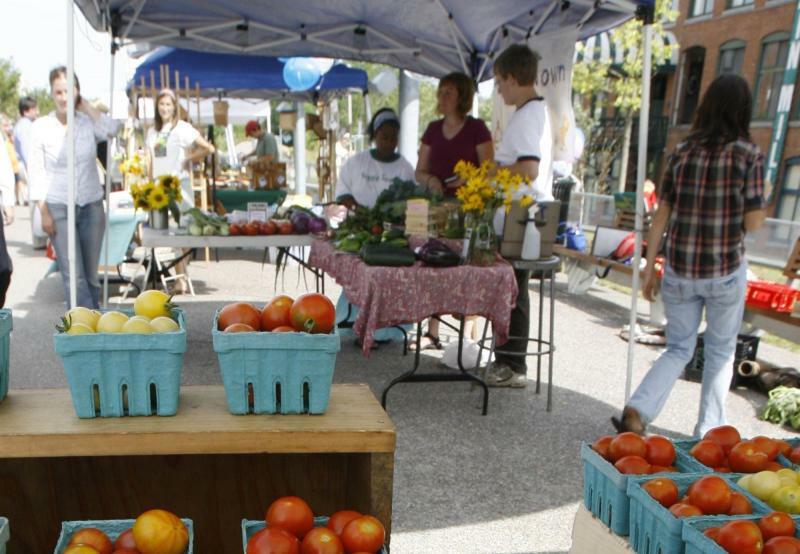 In fact, there are fewer farmers markets opening this spring. As a farmer in Bhutan, Laxmi Narayan Mishre provided food and stability for his family. But when ethnic tensions flared in the small Himalayan country, his land was seized. With his wife and ten children, Mishre would spend the next two decades living in a cramped refugee camp in neighboring Nepal. Rumors swirled about a possible resettlement to America, and what life would be like here.